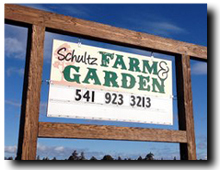 Schultz Farm & Garden is a family-owned and operated grower and retailer of a large variety of plants that thrive in our Central Oregon climate. Growing on 8 acres, with 4 greenhouses, and a user friendly sales yard, we strive to provide a friendly, informative environment for you to browse and shop for all your plant needs. We have a large selection of perennials, grasses, shrubs, fruit trees, evergreen and deciduous trees, as well as fertilizers, mulch and compost. And we offer delivery and planting services. HOURS: Change throughout the season.